The other day, Josh Cohen ( aka Publicola Bike Nerd) did a post with a link to a Jay Jansheski piece Some Things I’ve Seen While Riding a Bicycle in Seattle. A harmless fluff piece wouldn’t you think? No lectures, no stats and nary an environmental or health reason sited. He merely highlighted some positive reasons for riding a bike: because it’s just plain fun. And before I read the comments, I too was enveloped in a blissful bike loving fog. There are so many reasons I love to ride a bike. And I daydreamed about all of them for at least 5 minutes. This weekend we experienced reason #6789: because little detours sometimes change everything. When you’re on bikes, you may go a bit out of your way to check out the mysterious blue glow. 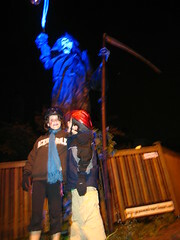 And when you get there, you discover it’s a giant grim reaper ( The Greenwood Reaper no less). And it’s a cold, crisp and clear Fall Sunday night before Halloween (when you really should be at home putting your kids to bed but it’s more fun to be out on the bike). And you laugh and marvel and take photos. And you realize that had you been in the car, you would have completely missed it. On bikes, the Greenwood Reaper turned an ordinary ride home into an unexpected adventure. How cool is that? Remember, that daydreaming about my bike riding reasons happened before I read the comments. But after I read the comments, (which are up to 178 at this writing) I was just plain disgusted. Who are those people who spew hate while hiding behind the anonymity of the internet? After a few minutes of wading through the hateful words, I couldn’t even remember what the original post was about. I thought it was a fluff piece and didn’t see anything in there that could evoke such vitriol. I actually went back and re-read it a couple of times just to make sure I didn’t miss something. What’s the deal with these people anyway? Would they say all of those nasty things to Josh’s face? or my face? or to my kids? Don’t they have anything better to do than troll Publicola all day? There really are so many reasons to ride a bike. And I’m sure the Greenwood Reaper will go on our kids list too. Along with ice cream. And the smell of the beach. And fresh doughnuts. And fireworks. And seeing funny naked people in Seattle and Portland. And on, and on. And all those haters will keep on hating and miss out on the fun. 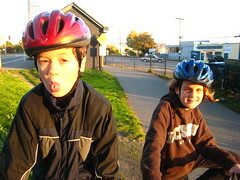 This entry was posted in bigger than here, bikes, family cycling, Ha, kids. Bookmark the permalink. I’m down with the Greenwood Reaper, daydreaming, ice cream, beach, donuts and it just depends on *how* funny those naked people are, but for the most part I’m down with them too. Bicycling is the anti-isolationist remedy for traveling our neighborhoods and city. they were *funny*, but not *too* funny! Every time there’s a bike-related story on the Seattle Times or PI, it’s the same thing. It makes me nauseous thinking there are people driving multi-ton machines who think my child and I should die because we take up 3 feet of road. I tell myself that they mostly live in the suburbs or exurbs, but that only makes me feel better for a minute. I really think the biggest problem for transportation safety in general is to get drivers to think of others on the road as *people* instead of cars or bikes. I’m not a bike, I’m a person on a bike. My dorky, midwestern solution is to wave and say good morning to everyone I can. Every time a car gives me a decent amount of space or waits patiently for me, I wave to them. I hope that makes them really see *me* as a person. And I think the mere act of riding with kids personalizes it. Reading comments on anything is always a bad idea, I’ve found. No matter what the story is about, wacko commenters find a way to make it crazy. Yes, we *are* people. And we’re having fun and waving and smiling. So there. I agree about reading the comments in the Times and P-I. Too many times, I’ve suffered the same wide-eyed shock as Anne while reading comments on a bike-related story. They are always the same, and I eventually decided that reading them doesn’t enrich my life in the least. Responding to them is pointless: it’s like trying to discuss an issue with a shouting, angry mob. Comments here and other bike-friendly blogs, on the other hand, are great and at their best can actually create a dialogue. I gave up on the Times awhile ago (in general). I just read the headlines and get my news elsewhere. Regardless, it’s just too bad. I love the Grim Reaper”, I’ll have to make the trip out there to see it. Thanks for linking Jay’s article, wonder why it was in the Slog and not the printed Stranger. I too have experienced the joy of discovery and the beauty of nature while I’m my bike. Even if you’re only the passenger in a car you never notice anything. Wow! I wouldn’t have looked at the comments until you mentioned them. They’re awful! Makes me sad there are so many angry and sick people. I tell myself that I am not going to read the comments. And then I do. And then I get depressed about the incredible incivility out there. And the pure meanness. But I keep pedaling away. I love the unexpected surprises we come across, pedal upon when out on our bikes. So no Greenwood Reaper here, but loads of other cool stuff. I think my family needs to start compiling its own list. These types of negative spews from the (virtual?) public always fascinate me (after the initial sickening reaction). It really would be interesting to study what triggers these people. What is the motivation behind the words? Do they feel a core element of their existence is being threatened somehow? Is it just a combination of the power of anonymity and mob flare up? Are they really experiencing some bad cyclist behavior that trumps the bad motorist behavior, or are cyclists just easier to pick on? Over the past year in this area (DC ish) we’ve had a couple of radio “personalities” spew the venom right into the ears of the driving motorists, advocating when confronted with those awful cyclists in “your way” to “just tap them” with your car, and other lovely/deadly suggestions. Talk about programing. My first reaction is always, “If they would just go for a bike ride…”. It’s tragic, really. They don’t know what they’re missing. There was a guy bragging about this topic on the original MyBallard Kidical Mass comment thread, of all places … creeps like him are Reason #6835 why my daughter will ride bikes. And absolutely, yes, as others said, we just have to try to spread the happiness that we experience. I think patience is becoming a lost art in our society (or maybe I’ve just been around my kids too much today). I know a woman who recently retired from her teaching job and commuting by bike, bus and ferry up here in the hinterlands of Skagit county. Every day she would ride 5 miles to the ferry, catch a bus from the ferry then ride the remaining 4 miles to her school every day. She did this for a good ten years because she loved it and knew it was the only way she would get exercise into her day. When she retired, she told me it had been fun but it was really hard too, in the rural setting. Folks would intentionally splash her, honk at her and practically run her off the road, constantly. I saw her every day riding through really crappy weather, (add 20 mph wind to Seattle rain and that is here. ) Anyway she said ‘you just learn to ignore it.’ So keep riding and learn to ignore the verbal assaults, they’ll probably change of their own accord eventually. People who do anything other than a drive-by on a newspaper article are usually pretty damaged. 1/2 of that thread is that Grover guy expressing his issues, whatever they are. Don’t worry about it. We live in a pretty crazy world, a world where Sharron Angle is a serious candidate for Senate. The only thing we can do is live in a way that allows us to retain sanity, and bikes are a great piece of that. Haters gotta hate; that’s not for I. Don’t even give them the satisfaction of reacting. Well, I must admit that I do honk back when honked at, but that’s just good festive fun. I hate comments that spout out statistics. I commute by bike period. I’m on the road. I follow the rules. Respect me. End of story. Those haters probably hate EVERYTHING. Not just bikes. I just looked at a smidgen of those comments on that article. They are hilarious! Those people don’t have a life. They should be riding their bikes and not quibbling over bikes stats etc. Bummer for them is right. I just looked again at a smidgen of those comments on that article. They are hilarious! Those people don’t have a life. They should be riding their bikes and not quibbling over bikes stats etc. Bummer for them is right. Please delete my repeated comment. I’m not a repetitive person.